When traveling by bus in Turkey, we tend to get anxious as the dinner hour approaches. As the bus downshifts, through the mesh shades we see a gleaming rest area/cafeteria/gas station/carwash facility specifically constructed for cross-country bus traffic. We feel trapped, robbed of the chance to eat at a local joint or at least of the right to strike out trying to find it. When you travel to eat, as we do, every meal matters – severely. A lengthy detour for something special is a welcomed part of our itinerary, if not the impetus for the trip. Most recently, while driving down the Ankara-Çankırı highway, we found just such a spot: the peculiarly named Baykuş Boğazı, or “The Owl’s Throat,” a rest stop that will surely figure into future road trips. It didn’t take a foodie detective to know that this place was the real thing. Many long tables sat in the shade under leafy sycamore trees and even more tables were on the porch of a long low building resembling a military barracks, surrounded by all sorts of other little sheds, like a mother goose with chicks. Out front, a fat kid sat on an overturned bucket beside crate upon crate of fresh cherries sold by the kilo for 5 TL. The parking lot was full. These were all promising signs, but the main attraction was in yet another shed, hand-painted brightly with the Turkish words for “famous pit kebab” (and spelled incorrectly, at that). This is the kind of sign that we jam the brakes for. We’ve spent plenty of time on the road hunting down such famous pit stops: Twix ‘n’ Tween in Centreville, AL; that giant tent outside of Guadalajara; a nameless spot on the road from Termez to Dushanbe marked only by a lightbulb strung up in a tree. And here, on the way to Çankırı, we felt, once again, that we’d arrived at such a spot. The Owl’s Throat might sound like an English pub, but this is a down-home roadside smoke shack complete with a pit master who looks the part. Burly and giggly, Bayram – his name, appropriately, means “holiday” – gladly took us on a tour of the facilities. We asked him where his meat comes from and he made a chopping motion with his hand toward a hill. “Over there,” he said. He showed us the pit where he roasts this very local lamb over smoldering coals throughout the morning. 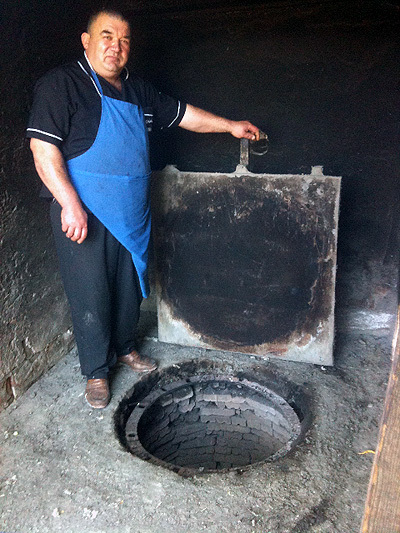 A blast of hot air carried the intoxicating scent of meat and smoke outward when Bayram opened the hatch of the cooking pit to pose for a picture. Back at his post, he took down a browned side of meat from a hook hanging inside his glass display box – the glass all sweaty from the heat – and thwacked it apart with a cleaver on a log chopping block. He smiled as he did it. So did we. The resulting two plates of meat, accompanied by a stack of freshly baked bazlama, a yeasted flatbread that’s very similar to an oversized English muffin, was such a perfect roadside meal that we vowed to return, and we did. Bayram was still at his chopping block and the glass was foggy with freshly smoked meat. Cherries were everywhere. The tables were, once again, full of local families gathered around generous plates of roasted lamb. It was a perfect scene. We were reminded of why we travel as much as possible – and by car.